The global reach of the “celebrity chef” Rick Stein is unknown to me, but certainly for those of us in the UK he is a well known figure and is perhaps almost single-handedly responsible for the gentrification of the beautiful port of Padstow in Cornwall. Unfortunately for most of you outside the UK you will remain unaware of the qualities that make Rick such an attractive figure (!!) as I understand that BBC iPlayer is unavailable outside of the UK. But if you use your imagination, in this episode from Stein’s current TV programme – From Venice to Istanbul – he arrives in the Peloponnese, visits the obligatory taverna followed by Paddy’s house at Kardamyli, where he takes a tour and Elpida cooks him moussaka to her secret recipe. Apparently Paddy did not like moussaka, but one day Elpida served it to him, he loved it and the dish was then a firm favourite. We also discover what is Elpida’s favourite English dish. Angelica Deverell describes the whole scene is “quiet moving”. Watch the episode here. Dive in at 33 mins 30 seconds if you don’t have time to watch it all. Only available until about the 9th of October under iPlayer rules. This entry was posted in Paddy's Houses and tagged Elpida, From Venice to Istanbul, Greece, Kardamyli, Rick Stein on September 26, 2015 by proverbs6to10. Only recently I watched the full series of Rick’s cooking program, here in Australia, and it was delighted that Rick visited PLF’s home at Kardamyli. An earlier episode had credited the view overlooking the Mesiniakos Gulf from Paddy’s garden terrace and I therefore tuned in in anticipation for a possible visit to his home. While TV Cooking program’s are not exactly my thing, Rick’s are however an exception since he seems to be always going off to places I’ve visited and importantly has such a positive approach to the kitchen table. 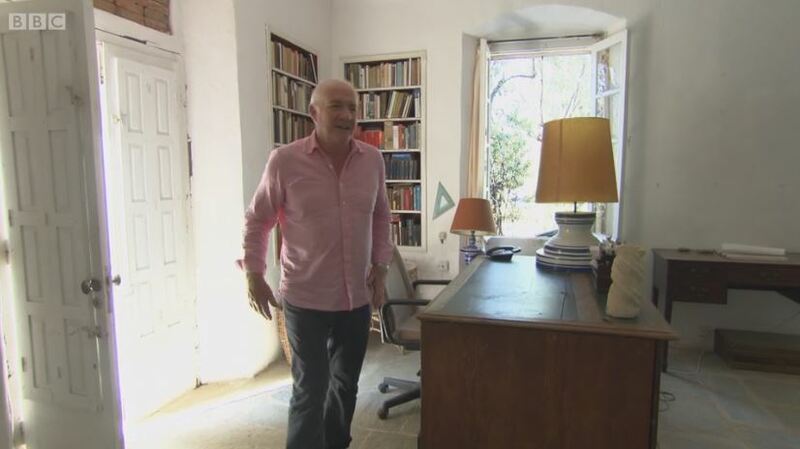 This said I was happy to see at least during the time of the programs production Paddy’s studio looked remarkably in tack all those years after my time when I visited Paddy in October 2004 – My blog An Encounter with Patrick Leigh Fermor shows this. While I did not get to try Elpida’s Moussaka she did make me a lovely coffee. Morning from down under. Rick’s programmes (and books!) are well known down under. Well he has a house and restaurant here as well. Look forward to this series reaching our airwaves. Could view it via the link and (shock horror) a virtual VPN (even have one on my smartphone), but will wait to few on the telly. Too much time following the RWC using VPN!! In Greece one does not ” Add ” ingredients to a dish , the verb used is ” Rixnw ” i.e. You ” Throw ” them into the mix . That sums up the fine carefree attitude of Greek Cooks to weighing things out by the gram , ensuring your teaspoon is perfectly flat , or never mixing metric and Imperial quantities . Meals also tend to be for the extended family and so are prepared in industrial quantities in a pot the size of half-a-galvanised-dustbin . You have to remember that many of the traditional Greek dishes were cooked using the simplest of technology . In those hill villages the means were often just the vestigal thorn-twigs fire-in-the-corner hearth , the hot ashes in a firepit in the yard , and the latent heat left in the village baker’s oven after the early morning bread-baking session . ( you took your lidded casserole down there to put in to slow-cook all day , collecting it in the evening , and buying your bread en-passant ) . Later on a two-burner Camping Gaz type stove became general , but only lately have the western pattern four burner , grill + oven style cookers become widespread . The point being , you dont NEED one of those giant range things to cook Greek things on . Many people try to start of with Moussaka , which is actually , as the film shows , quite a fiddley multi-stage dish to prepare . Inevitably this turns out as a disappointment , and not like the glutinous rich thing you had on holiday , and so you give up . The problems are 1 ) You tried to do one of the harder things first 2 ) You made it in too small a quantity , 3 ) you dished it up too soon . Many Greek things , especially the casseroles , are better on their ” Second life ” i.e. Cook on day 1 and re-heat and eat on day 2 . That allows all the flavours to mingle and coalesce in the dish . Like the ” Gigantes ” bean stew Rick showed , very many Greek things can be made using that basic Onion+Tomato+Herbs+seasoning sauce . And you can cheat too , so it doesn’t cost you a fortune . Throw chopped Onion ( + Garlic if you like it ) into about half a cup of Olive oil and cook on a medium heat until transparent . Throw in a tin of supermarket economy grade chopped tomatoes . I put in a cheapo vegetable stock cube , which has all the salt I want in there . Up to you . Give it all a stir , turn the heat down to simmer , and let it fester for 15 minutes . You simply then add any other main thing to make the dish you want . And let it slow-cook . And eat it on it’s ” Second Life ” . For Gigantes , two tins of Supermarket butter-beans , drained . For Bekhri Meze ( The Drunkards Dish ) add cubes of chopped chicken and pork to the Briam . For Bamies put Okra in the basic sauce . For Fasolakia , throw frozen green beans into the sauce . To make a Tavas , mix hunked beef and potatoes into the sauce and slow-bake on a low heat in the oven . And many more – Experiment ! ! ! Put some of the sauce over fish and Grill / Oven bake that . See , you CAN cook the Greek way . Easy-peasy . Serve all these things with Bread , a Greek salad , olives-in-a-dish , and wash it down with inferior grade Supermarket chilled white wine served in those beaker glasses . NOW you can have several goes at making a Moussaka , to perfect your own . As ever Christos your comments are both entertaining as well as informative. Thank you! I am staying in Kardamyli at the moment, and last week had the privilege of being shown round the house by the wonderful Elpida, of which I may write more when I return home. Just to add that she told me sternly that Rick got her moussaka recipe wrong in his book, because she always uses veal mince, not lamb, which she says is very important. That’s him told! So that’s then the authentic recipe as served to Paddy on his favourite pink and white English Staffordshire Johnson Bros ‘Blarney Castle’ plate, which sits forlornly up on the dresser in the kitchen. Elpida allowed me to take a picture of it but it’s blurred, as my hands were shaking so much.. Sorry, yes I realised my mistake when I looked at the recipe at home today, I think on reflection what Elpida probably said was that she doesn’t use beef or lamb for her recipe but minced veal. Now that ethically produced minced veal is available over here, I shall be trying the authentic recipe as soon as possible! Indeed, even in Belgium Rick Stein is known as we can watch BBC on cable tv & the PLF Moussaka is delicious, especially the next day ! I can confirm that the PLF moussaka is very good!